Walk With Sally’s signature Friendship program matches children with a sibling or parent facing cancer with adult mentors whose families have also been touched by the disease. Over the course of a year, mentor and child meet regularly and also participate in group activities with other Friendship pairs, all at no cost to the families the nonprofit serves. 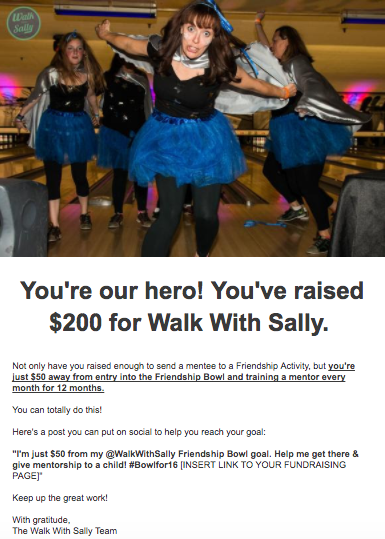 Walk With Sally emphasizes fun, connection-building activities and their annual Friendship Bowl is one of their biggest fundraising campaigns. For the event’s 10th anniversary, the nonprofit teamed up with CauseMic to take their peer-to-peer fundraising to the next level. 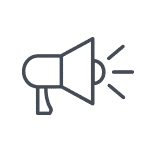 By taking advantage of Classy’s newly redesigned Peer-to-Peer Campaign and using engaging communications to mobilize fundraisers, Walk With Sally and CauseMic increased their Friendship Bowl’s year-over-year revenue by 158 percent. We spoke with CauseMic’s Noelle Smith to learn how they did it. Walk With Sally had dabbled in peer-to-peer fundraising in the past, but hadn’t tapped into their audience’s full potential. When they structured the Friendship Bowl as a registration with fundraising event last year, they struggled to motivate attendees to follow through with fundraising. That’s one reason they used a fundraise-for-entry model this year, explained Smith. Another was the aesthetically appealing and user-friendly Classy Peer-to-Peer Campaign. 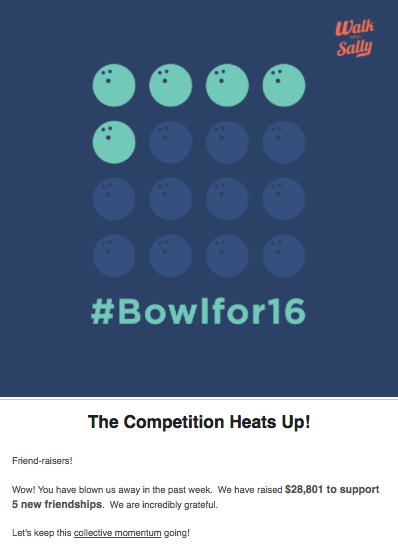 The #bowlfor16 campaign page features uses Classy’s Impact Levels feature. Along with having beautiful campaign pages that were easy to customize, Walk With Sally and CauseMic also knew they needed a clear and tangible goal to motivate their supporters. They wanted this campaign to fund 16 year-long Friendships, each of which requires $5,000 in funding. 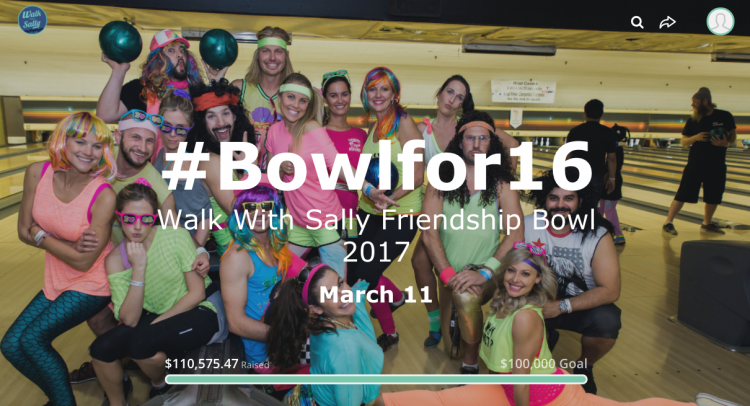 Rather than focusing on the overall dollar goal of $80,000, CauseMic and Walk With Sally promoted their #bowlfor16 theme. With this concrete goal of funding 16 Friendships, fundraisers and donors could see the impact their support would make. It also allowed Walk With Sally to update their community in a fun and engaging way. “We came up with these graphics to count off each friendship as it was funded,” said Smith. And when they reached their $80,000 campaign goal early, their theme allowed them to count off additional Friendships supporters funded. With the right campaign type and software, along with a tangible goal, Walk With Sally set themselves up for success. And their communications plan helped them reach the finish line. Together, these elements motivated fundraisers through healthy competition, team bonding, and small incentives. The prizes for weekly contests could be as simple as a Trader Joe’s gift card. “It doesn’t take a lot to incentivize people, but it’s fun to be part of the contest. Along with promoting competition, the weekly emails to fundraisers provided heartfelt reminders of why supporters got involved. Several emails included a story from a participant on who they bowl for. Supporters shared their families’ experiences with cancer to motivate and inspire each other. While weekly emails kept all fundraisers up to date on the larger campaign’s progress, Walk With Sally used the new Fundraising Suite’s Milestone Emails to update individual fundraisers on their progress and motivate them to keep going. Peer-to-peer fundraisers automatically receive a milestone email when they raise a designated dollar amount or percentage of their goal. These messages recognize and thank fundraisers for their success, but CauseMic and Walk With Sally also used them to show people how close they were to important fundraising levels. “We sent those to go out just when they were below a given level, and that was sort of subtle and intentional so that fundraisers would open those and see that we weren’t quite at that giving level,” Smith explained. Walk With Sally used Milestone Emails to identify successful fundraisers and help them reach greater heights. They targeted fundraisers who were approaching a milestone sum and sent them a little extra encouragement to keep going. They also included a simple fundraising appeal their supporters could share in an email or on social media. Together, Walk With Sally and CauseMic combined fundamental fundraising best practices with the right campaign type and software to make the 10th annual Friendship Bowl their most successful yet. They raised $119,267 and increased donor transactions by 80 percent. By translating their fundraising goal into tangible impact, they motivated their supporters to not just fulfill their original #bowlfor16 objective, but to fund four additional year-long mentorships. Their astute planning and coaching allowed Walk With Sally to take their signature fundraising event to a whole new level.